The School of Nursing and the Atlanta VAMC partner on several initiatives in addition to the VANAP programs for BSN and MSN students. • The National VA Quality Scholars Advanced Fellowhips train nurses and physicians to develop innovative approaches to enhancing health care services for veterans. • Dedicated education units, or DEUs, provide one-on-one clinical training for BSN students in psychiatry/mental health and geriatrics at the VAMC. • This past summer, six juniors completed clinical internships at the the VAMC sponsored by the VALOR (VA Learning Opportunities Residency) Program. All of the students are in the VANAP program for BSN students. May 2015 marked a milestone in the life of each program. 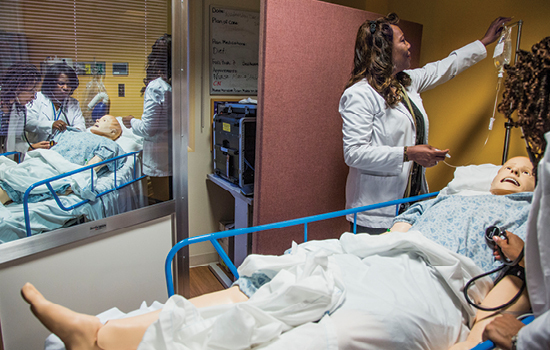 First, the VA selected Emory and five other U.S. nursing schools for the VA Nursing Academic Partnership for Graduate Education (VANAP-GE) to train advanced practice nurses to care for aging veterans. 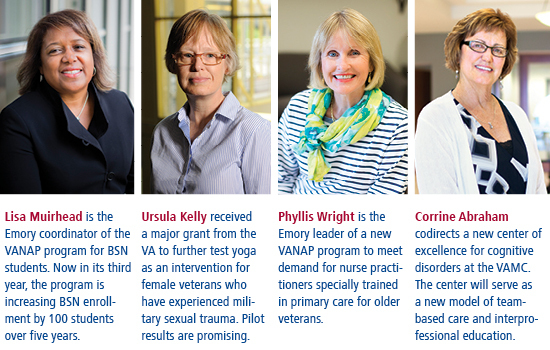 Through VANAP-GE, Emory will add five faculty positions, to be held by VAMC nurses, and grow its adult/gerontology nurse practitioner program by 32 students over five years. The first six students began the program this fall. Also last May, the first students in the VANAP program for undergraduates received their BSN degrees after two years of courses at Emory and clinical rotations at the VAMC. All trained in various aspects of veteran care, including mental health, traumatic brain injury (TBI), home-based health, women's health, and homeless care. Now in its third year, VANAP is funding 10 new faculty positions and adding 100 BSN students over five years. It also includes a clinical innovation component to provide refresher courses and simulation training for VAMC nurses, all taught by Emory faculty. Emory's relationship with the Atlanta VAMC dates back some 70 years. The VAMC has provided clinical placements for BSN and MSN students for many of those years. 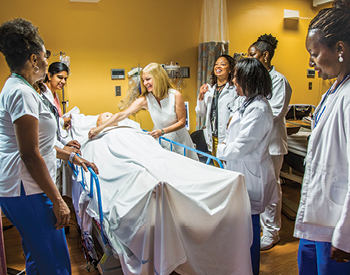 This alliance gained traction when Emory nursing dean Linda McCauley and VAMC chief nursing officer Sandy Leake MSN RN deepened their partnership. A key step was recruiting Ursula Kelly PhD ANP-BC PMHNP-BC as a VAMC nurse scientist and assistant professor of nursing in 2009. 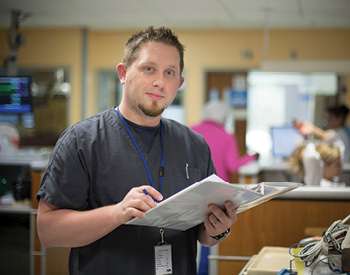 The VAMC half of Kelly's position helps fill a need identified during the VAMC's successful Magnet designation process to develop a program of nursing research and incorporate evidence-based practice into nursing services. Since arriving, Kelly has developed a significant body of research on PTSD and on military sexual trauma (MST) among female veterans. This year, she received $1.1 million from the VA to further test an intervention for women who have experienced MST, which often leads to PTSD and other mental health issues. Her four-year study will compare the benefits of trauma-sensitive yoga and cognitive processing therapy. It also will examine the effects of yoga on chronic pain, insomnia, and inflammatory and acoustic startle responses related to PTSD. Approximately 210 female veterans are expected to enroll. It's not unusual for these veterans to delay treatment for MST and/or PTSD for years. "There is no age restriction and no physical limitation for women veterans in this study," Kelly says. She also has a clinical component in her work at the VAMC, where she sees veterans in the outpatient PTSD clinic. Within the clinic is a dedicated MST treatment team—a standout for the VA nationally, notes Kelly, a certified adult and psych/mental health nurse practitioner. "The VA has always been a leader in PTSD treatment and research," she says. "But in the past decade, the number of veterans, male and female, has grown substantially because of the conflicts in Iraq and Afghanistan. And because health care has improved so much in the field, soldiers are surviving more than they used to with more complicated and devastating physical problems such as TBI." As Kelly's work at the VAMC has expanded, so has demand for expertise in evidence-based practice. That need has been filled by clinical assistant professor Corrine Abraham DNP 85MN RN, who serves half time as coordinator of evidence-based practice and innovation at the VAMC. She wrote her own job description after completing a National VA Quality Scholars Advanced Fellowship there. As a result, she is working with VA nursing executives to strengthen capacity in leadership, education, evidence-based practice, and quality improvement. Abraham also codirects the new VAMC Specialty Care Education Center of Excellence for Cognitive Disorders, supported by a $1.5 million three-year VA grant. She and Emory physician Anne Tomolo MD MPH envision the center as a new model of care for veterans and a new way of teaching interprofessional students. "The center will help bridge the gap for patients by integrating telehealth and shared appointments with team members specializing in psychiatry, gerontology, palliative care, and social work," says Abraham. "Students will learn about specialty care for cognitive disorders with an emphasis on teamwork, collaboration, and quality improvement." Abraham and Kelly fully expect to intersect more with students in both VANAP programs, before and after they earn their degrees. "Students who come to the VA, especially graduate students, traditionally have episodic experiences," says Abraham. "The residency program for VANAP graduates not only furthers their education but also makes them more effective as new nurses since they are more familiar with veteran-centric care." Leake, the VAMC's chief nursing officer, welcomes the infusion of VANAP students for that reason and more. 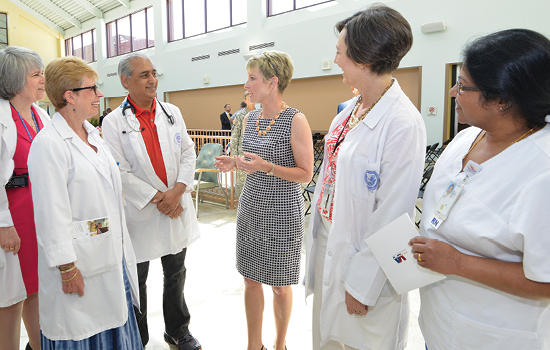 "The VA headquarters in D.C. is committed to ensuring there is a steady pipeline of nurses graduating from high-quality nursing schools who are prepared to care for veterans," she says. "But recruiting qualified nurses into the VA system is not necessarily the ultimate goal. The VA feels a broader responsibility to prepare nurses who are sensitive to veterans' unique needs, including nurses who work outside the VA system. The larger goal is to ensure that veterans everywhere receive the very best care." Working at the VA gets in your blood, note Sandy Leake MN RN and Michelle Cox-Henley 84MN RN. Both began their VA careers in Gainesville, Florida, and now serve as top-level VA nursing leaders in Georgia. "The mission of the VA hooked me early on," says Leake, who has served as CNO of the Atlanta VA Medical Center (VAMC) for 20 years. "I was immediately struck by this incredible sense of satisfaction in working for and on behalf of veterans. The mission of the VA hooked me 25 years ago, and I find that happens a lot." Cox-Henley worked in the private sector and earned her MSN in critical care nursing at Emory before joining the Malcolm Randall VAMC in Gainesville, where she advanced to chief nurse of surgery and collaborated with other VA facilities. She also hired Leake, who had just completed her graduate degree on a VA scholarship at Vanderbilt University. 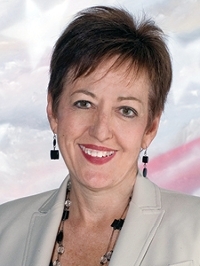 Cox-Henley later was recruited to the Charlie Norwood VAMC in Augusta, Georgia, where she has served as CNO for four years. After arriving in Augusta, Cox-Henley faced a large nurse vacancy rate and difficulty in recruiting nurses. She worked with the medical center director to increase salaries to attract competent nurses to work at the bedside and in nursing administration. More recently, she implemented a shared decision-making model at the unit level for nursing staff in collaboration with physicians, laboratory services, physical therapy, and other disciplines. Nurses also have embraced a new 72/80 work schedule (72 hours of work, 80 hours of pay) under her leadership. The nursing shortage remains a challenge and, like its Atlanta VAMC cousin, the Augusta facility offers a residency program to attract and retain new nurses skilled in veteran care. It also strives to serve a growing number of unique patients—currently 46,000—from Georgia and nearby South Carolina. "Any change that we make takes a lot of momentum and more time than in the private sector," says Cox-Henley. "It's like moving a large ship. The challenge for the VA is to remain focused on the patient while the bureaucratic noise goes on around you."